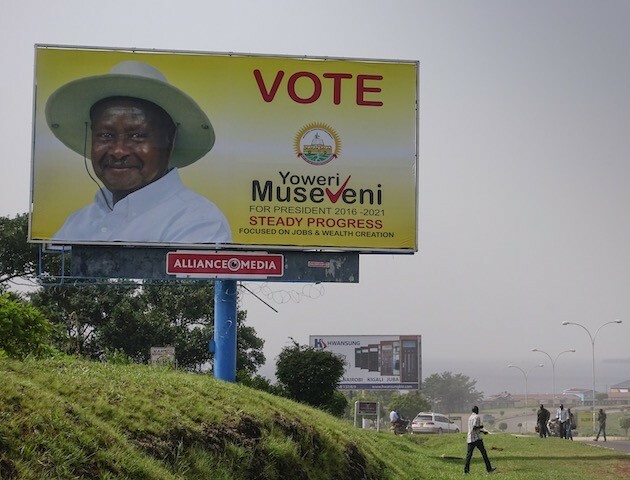 Uganda Decides | President Museveni Secures Another Term Extends 30 year-rule! President Yoweri Museveni has secured another five year term in office, after emerging winner of the 2016 presidential elections. Dr Badru Kiggundu, the Electoral Commission chairperson, declared Museveni the newly-elected president on Saturday afternoon at the National tally center at Namboole Stadium a few minutes to 4:00pm. According to the final tally issued by Kiggundu, Museveni garnered 5,617,503 votes representing 60.7 percent, Dr Kizza Besigye, the FDC presidential candidate scored 3,270,290 votes representing 35.37 percent, Independent presidential candidate Amama Mbabazi polled 132, 574 votes representing 1.43 percent. Abed Bwanika, the president of the People’s Development Party got 86, 075 representing 0.93 percent and Prof Venansius Baryamureba polled 51, 086 representing 0.55 percent. While Maureen Walube Kyalya garnered 40,598 representing 0.44 percent, General Benon Biraaro 24, 675 representing 0.27 percent and Elton Joseph Mabirizi polled 23,762 votes representing 02.26 percent. According to the Commission the total votes cast were 9,246,563 out of the 15,277,198 registered voters. Kiggundu explained that they hadn’t received results from 1787 polling stations but said their tally would not affect the final outcome of the results. The election has been marred by massive irregularities with delayed delivery of election materials, allegations of ballot stuffing, delayed release of results, disappearance of results declaration forms and ballots among others.